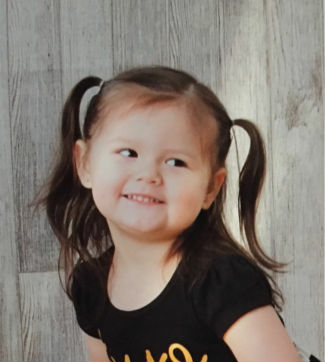 Just after Chloe turned two in March of 2016, she caught what appeared to be a cold, but when a week had passed not only did her cold symptoms continue but her fever would not go away. She was taken to urgent care when she refused to eat or drink anything. Doctors did some testing assuming she had a virus but just two weeks after Chloe’s second birthday, these tests showed she had Acute Lymphoblastic Leukemia (ALL). Chloe was immediately taken by ambulance to Doernbecher Children’s Hospital where an oncologist was waiting. Doctors sedated her the next day to do a bone marrow biopsy that confirmed her diagnosis of Leukemia. Chemotherapy was started immediately. After five days in the hospital Chloe was sent home where she began taking heavy doses of steroids for the next 30 days. Her appearance changed greatly due to the swelling. She continued infusion chemotherapy twice a week for the first month. By August of 2016 Chloe was only scheduled for weekly chemotherapy infusions combined with another powerful chemotherapy medication which was the worst, as it caused nausea, vomiting and the loss of her hair. As of January 2018, Chloe entered the maintenance phase of her treatments. She continues a strict regimen of medications including more steroids and chemo infusions once a month. Although Chloe is in her maintenance phase she is doing incredibly well. She will continue her treatments until June. Despite all of these challenges, treatments and hospital visits, Chloe is one of the sweetest four-year olds you will ever meet. She loves to laugh and enjoys making others laugh too. If she sees someone sad, she will tell you, “Don’t be sad, Chloe is here”. Chloe loves her cousins, going to the park, singing, dancing and music. She would eat pancakes all day if she could, although she loves pasta, fries and avocados. Her favorite toy is her Barbie Dream House but she also loves Anna from Frozen, Moana and Paw Patrol. Ladybug Girl and Bumblebee Boy are her favorite books. Chloe will be adopted as a Sparrow to Beaumont Middle School. Students will work hard to raise money for Chloe through sponsored community service and fundraising.